Celebrity chef Guy Fieri was one of the featured hosts of the 2011 Atlantic City Food & Wine Festival held this past weekend. Guy's Big Bite Brunch on Saturday packed the Caesars Atlantic Grill with 300 guests, each excited to meet and greet the host while dining on a 6-course brunch menu. The menu started off with breakfast pastries topped with whipped maple butter, followed by buffalo mozzarella and Jersey fresh tomatoes. Additional courses included Cajun fettuccine alfredo and a take on "steak & egg" -- grilled filet mignon and a poached farm egg served over a homemade English muffin, then topped with chorizo hollandaise sauce -- plus Guy's signature dishes of "Big Bite" French toast and a Baltimore "Bad Boy" sandwich served with crispy potato flauta. For dessert, guests indulged in fresh strawberries covered in pretzel-crusted chocolate. Fieri's inspiration from the menu came after sitting down with the Atlantic Grill staff and discussing foods that would be satisfying after "a hard night of partying," namely fried and creamy fare. Service style was also important; the last thing he wanted was yet another buffet line. "I want to know that the food that was coming out [of the kitchen] was made five minutes ago," he said. 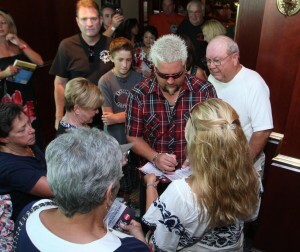 During the brunch, Fieri mingled with fans, signed autographs, and dished out plenty of cooking tips. When asked how to recreate his flavorful chicken recipes, Fieri replied that a lot of people rely too much on sauce to make chicken taste good. He recommended soaking chicken in brine (equal parts sugar and salt in water) before cooking, along with any other desired flavors. After the brunch, Fieri planned to visit the White House Sub Shop, his "all-time favorite joint," and order a large Italian sub sandwich to go. "The energy in the place is as good as the food," he said.